Warblers in the Mist is a 3-hectare property that has been largely cleared. Historically, it has been subject to grazing and slashing. Work on this property has focussed on control of aristea, control of an invasive grass species (Setaria sphacelata var. sericea), monitoring natural regeneration and growth measurements on regenerating native plants. 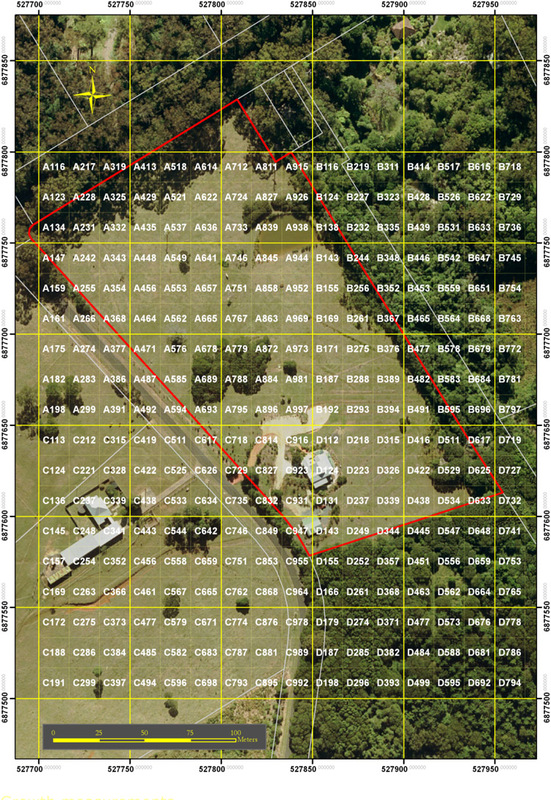 For the purpose of monitoring, the property has been divided into a 150-metre grid, further divided into 16.67 m x 16.67 m cells. 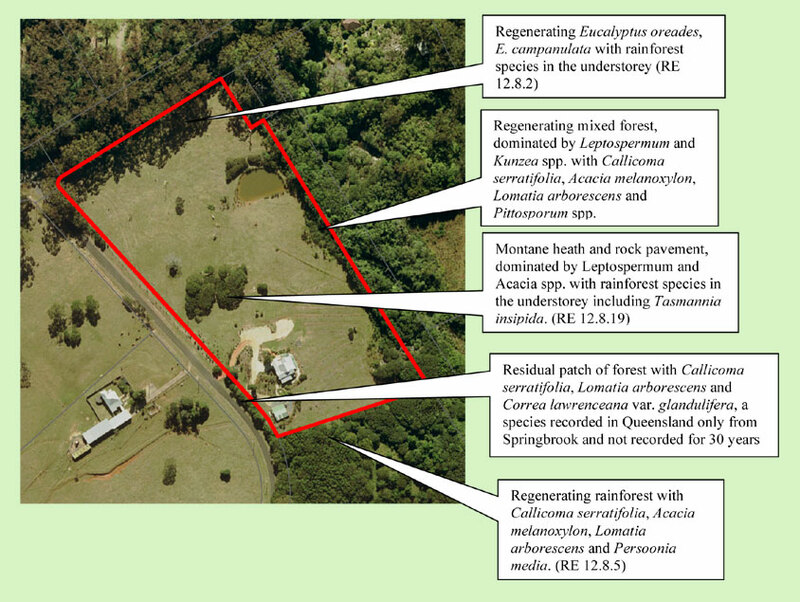 Since the property was acquired by the Queensland Government in 2007, there has been very significant regeneration of native species. The main species are Leptospermum spp., Lomatia arborescens, Acacia melanoxylon, A. orites, A. ulicifolia, Persoonia media, Eucalyptus oreades and E. campanulata. A total of 52 species has been recorded including three near-threatened species. Note: This aerial photography was taken in 2005. Since then, there has been signficant natural regeneration. The location of essentially all of the regenerating plants has been marked with a pink plant marker with the exception of the south-east corner of the property where the density of leptospermum seedlings is such that marking is not practicable. Regenerating native plants marked with a pink plant marker. 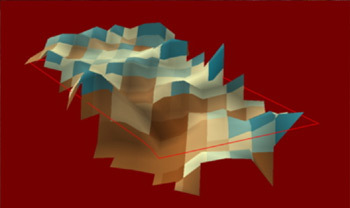 Eight cells have been selected for growth measurements, four at the northern end and four at the southern end. Measurements are made at the beginning of each season, recording height, breadth, general health (including mortality), leaf area index and herbivory. More than 3000 individual plants are being recorded. The property has a major infestation of a weed new to Queensland, Aristea ecklonii (Blue Stars). Aristea is a member of the Iris family and has rhizomes from which it can re-shoot after damage such as from frost. It can grow in the shade and produces a dense mat covering the ground. It has the potential to invade native forest and prevent regeneration of canopy and understorey species. Aristea has been treated across the whole property with a solution of glyphosate (2%), penetrant (pulse, 0.2%) and a dye (Herbidye, 2%) using a backpack spray with a finely controlled nozzle that effectively eliminates spray drift. The treatment has been effective but does not produce complete kill. One possible reason is that clumps are comprised of multiple plants and each individual plant needs to be treated. A further reason may be that rhizomes are not killed and resprouting occurs. Follow-up treatments have been applied on a significant part of the property. Herbicide is used with caution, as several species of frogs, including rare species, have been observed or their calls heard among the grass. One has been observed on leaves of Aristea. A separate page on this web site provides more information on aristea. Much of the property is infested with the grass, Setaria sphacelata var. sericea. 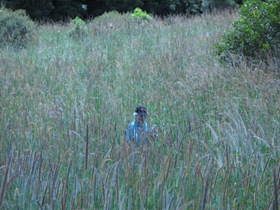 This grass grows to 2 m high and in dense clumps. It essentially smothers regeneration. To date, control has been by mowing and brushcutting. Soil moisture measurements have been made across the entire property. The results are illustrated below. The gradation from blue to brown represents wet to dry.